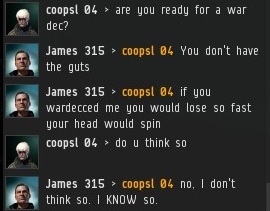 It's always a pleasure when someone threatens to wardec my humble one-man corp, Experimental Fun Times Corp. I have won every war so far. Most threats of wardecs are never realized, but occasionally someone will pony up the 50 million isk required to launch the 'dec. In all, I have been wardecced eight times, with each 'dec defeated by dissolving and reforming the exact same corp. I blogged about this from the beginning, but not everyone reads every MinerBumping post--a mistake, to be sure. 400 million isk of damages have been inflicted in this manner. Now turn back the clock to October, when Agent Galaxy Pig braved the wilds of EVE-O to request that CCP make a public statement about miner bumping. A few months later, they finally did. At the time, Beachura and other denialists wanted everyone to just ignore the New Order, hoping we would go away. You might remember Beachura's alliance, Double Tap., for its failed merc contract against us last autumn. Sadly, I was pre-blocked by the valiant space-lawyering denialist failmerc. I am unable to contact Beachura, but hopefully this won't be the last we hear of her. I would hate for things between us to be left like this. The dreaded war evasion mechanic... the carebears' greatest gift to Experimental Fun Times Corp. 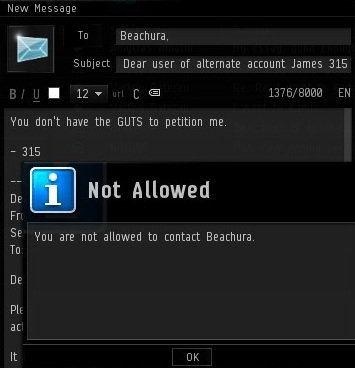 Tremendous irony in Beachura threatening to petition for it. Every tool they have, we also have. One thing I love about the New Order is how it exploits the game mechanics so effectively. And how so many others, CEOs, and those who should no better are completely ignorant of those mechanics. Just the other day I had a corp CEO tell me how we couldn't attack barges in hisec because CONCORD! Like he'd never heard of suicide ganking. Luckily I wasn't talking to him because I was going to gank him. I was talking to him to establish 'rebel' cred for the awoxer he was going to send an invite too an hour later. That CEO got to learn about all sorts of new game mechanics that night. The New Order is very educational. Kind of like Eve University only more fun. Anyway, why would this be any more of an exploit than dropping corp to a NPC corp to avoid a war? 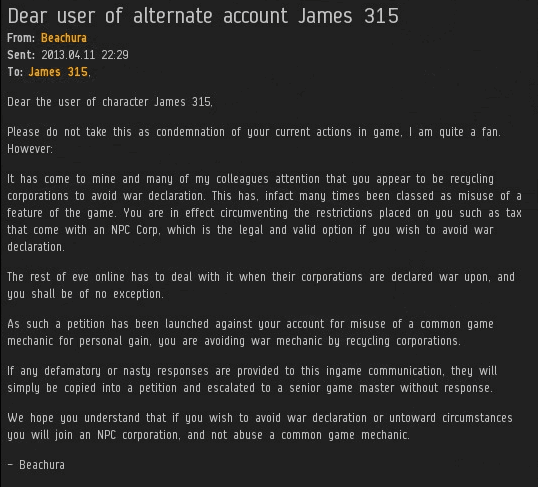 I get that it's *not* an exploit, I'm saying it's funny the people petitioning James probably think it's fine to drop corp to avoid a wardec, but somehow what he does is bad. Please don't throw me in that briar patch! I never knew you needed a war dec to shoot a -10 in empire space! Aren't you embarassed by posting such poor sarcasm? Because what you actually didn't know was that James_315 has a +0.1 Sec. Really well that is embarrassing not to know that. Actually as I'm on holiday it's more embarrassing posting on gaming sites while waiting for a cooked breakfast. Actually this site is that good so what's more embarrassing is war deccing a solo corp and not reading the very public blog behind it for you know... intel and background information. Of course James315 has a good security standing. He bumps miners with his Invincible Stabber, which requires a good security standing to operate Invincibly. Another demonstration by James of the importance of alt characters, or teamwork if you prefer. At least New Order is finally showing its true colours as a griefing organisation. I approve. We do not pursue miners after they have given up mining, or have bought a permit. Therefor this is not griefing under CCPs rules. And its times like this you can feel the ending of a great game coming to an end. When the idea of what may have started out as something great gets twisted and ugly to the point that the ones that so violently stood for something now stand for nothing more than destruction. Be ever so careful that the snake does not swallow its own tail in the name of game mechanics. "And its times like this you can feel the ending of a great game coming to an end." So, is this the end of the beginning or the beginning of the end? I don't think they will be happy until they destroy the game...leave it to the N.o. to do it. Carebearism will destroy the dark and angry EvE Online that we all signed up for. Carebearism is a disease. We are the cure. Destroy the game....never. They will destroy themselves first before that happens. its already happening. He ran for Csm..and dropped out....Epic fail there..and now all he got left are children of the lost following him...lol. maybe you just arent aware that subs are at an all time high. maybe you just dont accept that new players find and join the New Order daily. one one hand all these poor nay-sayer babies claim the New Order is a fad, and will be gone soon. then on the other hand the New Order is the single most influential group/movement the game has ever seen, with the power to topple the entire globe of active players. i think its time for a thicker tinfoil hat, and to take your meds. You might be right about you needing a thicker tin hat and med. Everybody says there the"best" and can do "all" these things... delusions of grandeur seems to be something in your meds at the moment. despite everything he has done, please enlighten the people of just how COP has changed its ways because of what he has done? I don't see anything , it not on the new update coming out in June. Is he keeping it a secret or something?.Like you said..your just a fad...one that will blow away and when it does, i'll quickly make corp that you can join and follow, i'll call it.."Dead Order". That should help you sleep at night at lease right? Sad to say this...but he's got a point. You somehow got a point out of all that nonsense and broken (but probably native) English? I gotta say, I notice new names on kill mails every time I log in, all these new faces eager to progress the cause, anxious to purge Highsec of the automatons in the name of emergent gameplay, risk:reward, and James 315. The carebears come here to post "James 315 is dead!" over and over again, as if that will make is happen. It's like a cargo cultist making a mock airfield and a bamboo aircraft mockup, and hoping that Cargo will come. Two....I thought Beachura was a Xenuria alt? And Three.....the ironies, they are delicious.